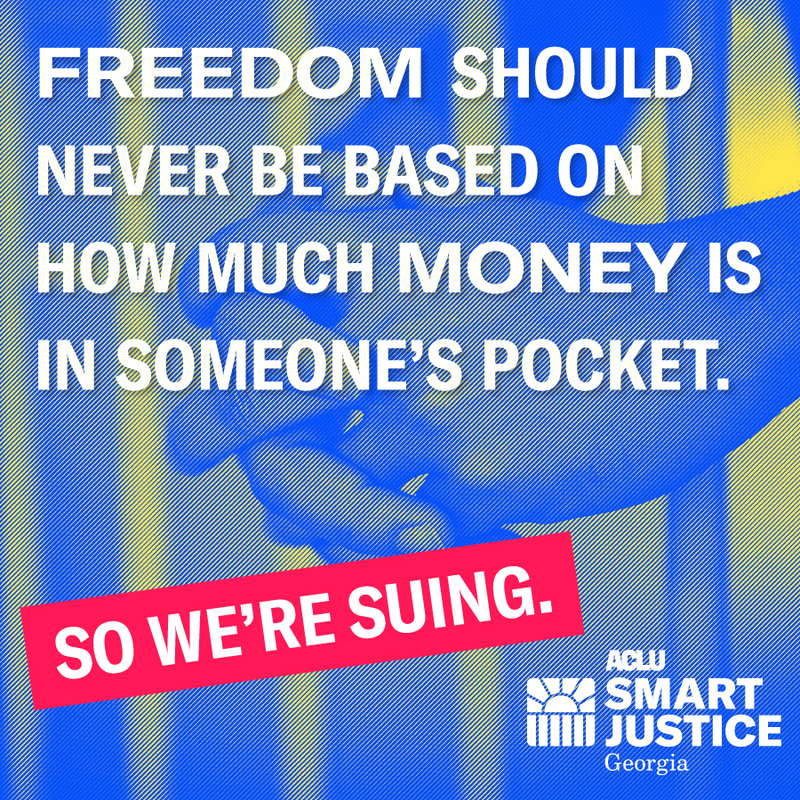 BRUNSWICK, Ga. — The ACLU of Georgia and the American Civil Liberties Union have filed a federal class action lawsuit against Glynn County, Glynn County Sheriff E. Neal Jump, Glynn County Chief Magistrate Judge Alex Atwood, and B. Reid Zeh, III, seeking an immediate and permanent change to an unconstitutional cash bail system that discriminates against people who are financially strapped. The county, along with Sheriff Jump and Judge Atwood, has set predetermined amounts of cash bail for each misdemeanor offense, a practice that violates nearly 40 years of U.S. Supreme Court precedent. In Bearden v. Georgia (1983), the Supreme Court stated that people cannot be jailed simply for being poor. The high court wrote, "Over a quarter-century ago, Justice Black declared that '[t]here can be no equal justice where the kind of trial a man gets depends on the amount of money he has.'" For example, plaintiff Margery Mock is incarcerated on a $1,256 bond on an alleged criminal trespassing charge from trying to visit a relative at a motel. Because she is unable to pay the cash bond, Ms. Mock remains in jail. In addition, the lawsuit claims that those who are accused of misdemeanors and unable to hire a defense attorney are left to contend with Mr. Zeh, an attorney who contracts with Glynn County to represent them. However, as the suit alleges, Mr. Zeh has a practice of failing to visit detained clients or to represent them in bail proceedings. This is a violation of the Sixth Amendment's guarantee of a meaningful defense. The ACLU Campaign for Smart Justice – an unprecedented effort to reduce the U.S. jail and prison population by 50 percent and to combat racial disparities in the criminal justice system – has launched a new initiative focused on bolstering the movement to end money bail and eliminate wealth-based pretrial detention through legislative advocacy, voter education, and litigation. The lawsuit in Glynn County is the third related filing by the ACLU in 2018 alone, with many more to come in the effort to end our over reliance on the cash bail system.